Should you take the kids to Ellijay, Ga? YES! By all means. But…should you also plan a date night escape there without them? Double YES! Dan and I visited this mountain town for a summer date night escape, and I was blown away by all there is to do! We’ve created an itinerary for you below, with all the best things to do in Ellijay, Ga! From exploring Downtown Ellijay to hitting the water, and from the perfect accommodations to the ideal eats & treats…here is how to enjoy Ellijay, Ga. Ideally, you’ll be able to escape work a little early and head to Ellijay by lunch time. We recommend you grab a quick and easy (but delicious) lunch at Back Porch Bistro. It’s right off the square, with plenty of free parking. Dan and I both had the half-and half…with half a sandwich and a bowl of soup. It was really delicious. We also heard that the owner makes a mean apple cake…people buy the whole cake to take home because it is so tasty. You don’t have to do that, though…you can just share a slice when you visit. Don’t miss it! We started by leaving Back Porch Bistro and exploring The North Star Emporium that sits in the “front” of the restaurant (they are connected.) It is a cute place with vendor spaces and tons of trinkets. From there we headed to Mountain Treasures…because…wine! The front of the store has super cute clothing for sale (yes, I did buy the most adorable daisy top there…I can’t wait to show you all soon!) But the back is where the action is. You can sample a selection of wines from Cartecay Vineyards (an Ellijay winery) as well as some Moonshine! After your tasting, be sure to try the wine slushy. The blueberry was my favorite, but they also had peach. Here’s a tip…if you think you can handle the wine without spilling, then do your tasting first and then get a slushy…all before you check out the clothes in front and the furniture and decor in back because you can’t leave the store with your drink. They also had a very masculine soap for Dan, which he is enjoying. And let me tell you about the special treat I got! It’s a soap bar for shaving. It lathers up really well…and when you shave, your legs are as smooth as a baby’s. Plus, you don’t need lotion afterward. I think everyone I know is getting a bar for Christmas now…don’t tell them! They also have jellies, pickles, meats, drinks, and art…all from local artisans. What an inspiring mission. Across the street, you’ll want to head into The Martyn House In Town. Yes, these are the same owners as the Glamping location. Grab a coffee (it’s Batdorf & Bronson, which we love) or a snack. There are plenty of places for lounging, but one of the patios would be my pick. While you’re there, be sure to look around at the art. The photography is exceptional, and it’s the work of owner Rick Lucas. Feeling relaxed yet? Now it’s time to head to your accommodations for the evening. We have two equally amazing recommendations for you. Check them out. It sits on more than a dozen acres, with a garden for roaming, a pond to relax by, and several trails. It is an adult-only accommodation, and extremely romantic. Please click through and read our full review, with videos and photos! Another spectacular option is Elatse’yi (which is the Cherokee name for Ellijay.) We didn’t have a chance to stay here, as it was full when we visited…but we did meet the owners and tour the property…it is spectacular! Elatse’yi offers two airstream “glamping” options PLUS a geodesic dome…cool, right?? The first airstream cabin includes all the essentials, including a private covered deck with wicker and leather lounging furniture, plenty of space, and (drum roll please) an outdoor shower! Yes, it’s heated..and yes there is privacy, created by walls made of wine bottles reflecting light off the dim light of dusk. The second airstream includes a large star-shade tent hiding a lounging area with hammocks. It is also the star of the show because it includes a treehouse for enjoying a glass of wine or singing sweet-nothings among the tree canopies. Geodesic dome glamping in Ellijay! The third glamping option here is a geodesic dome – and Elatse’yi might have been the first in the country to do this! Words and photos cannot describe how cool this is! It sits on a decking, private among the trees. Inside you’ll find eclectic furnishings with a queen bed, two twins, unique games that the owners picked up on their many travels, and a telescope for star-gazing. Even a foosball table! On the deck you’ll find a private claw-foot tub for soaking up the stars with a bubble bath, a private bathroom, and plenty of space for entertaining. Just in the back is a “cowboy kitchen” for all your cooking desires! Additionally, there a numerous public spaces at Elatse’yi including a large picnicking space by a waterfall, a pond filled with fish who love when you feed them, a bocce ball area, a place for archery…and plenty of trails! Fabrizio and Jeffrey are impeccable hosts, and would welcome you with open arms. They are also super story tellers, of a life before this one which included too much work and not enough travel – and how life has changed for them in the best possible way. Of course there are also lots of other places to stay in Ellijay. Score a discount on your accommodations with our partner Hotels.com. On Old-Fashioned at 1907, with 13th Colony bourbon. Delicious. There are plenty of great dining options, but we wanted something special so we picked Lee’s on River Street at the 1907 on our Friday visit. It was romantic and fun, with limited wait for a table. We enjoyed a few drinks while listening to live music upstairs. The bar manager, Edward, has a passion for unique drinks using local ingredients (like lavender from a nearby farm and 13th colony bourbon.) His drinks were spot-on! For dinner we enjoyed a steak with veggies, and a juicy burger with pimento cheese. Very very delicious! It starts at 7pm and it’s free, though I’m sure they’d appreciate a ‘thank you’ in the tip bowl to help keep things going. We had a great time there! Afterward, head back to your room for the night. You can enjoy a bath under the stars like we did, listen to music by the pond, break open a bottle of wine…and watch the stars like you’ve never seen them before! Engelheim Vineyards offers fantastic views with your tasting. Wake up early and get your breakfast on. You can enjoy a breakfast spread at The Martyn House, or fuel up at Cornerstone Cafe on the square. I recommend the omelet with homefries! Don’t skimp here though; you’ve got a big day ahead. You’re going to want to adventure on Ellijay’s Carter’s Lake this morning. Carter’s Lake is special because of its 62 miles of natural shoreline. There are no private docks or development along the edge, so it’s great views in every direction. Photo of Cooper at Tumbling Waters on Carter’s Lake from a previous visit last winter. There are a number of ways to enjoy the lake. Which of these best fits your style? Rent a pontoon boat from the Carter’s Lake Marina and float your cares away. Visit Harris Branch Beach and enjoy the sandy beach area. Bring your bike and ride the 3.5 mile Amahady Trail. It ranks easy/moderate and should take about an hour. The Big Acorn Trail is the shortest and easiest if you feel like taking it easy. You can extend that walk by including the moderate Talking Rock Nature Trail. It begins near Northbank Park and is the most strenuous. Oak Ridge Nature Trail is another moderate option, and runs a little over 1.5 miles. There are places to swim here, too. Tumbling Waters is a fun walk at the Ridgeway Park entrance. There is a towering bridge and interesting forestry. Hidden Pond Songbird Trail is an exceptionally peaceful and easy trail with opportunities to see great wildlife. It begins at the Carters Lake South Reregulation Park. Finally, if you have your own kayak, set off from the Ridgeway Recreation Area via the Coosawattee River. I’ve read several reports of small waterfalls along the edge that are great to see, hear and feel – the gentle breeze from the falling water must be exhilarating. be prepared for a few class I rapids, too. After you work up an appetite, it’s time for lunch. You’ll want to make your way to Country Corner Kitchen. If you ask me, this is Ellijay’s best kept dining secret. It sits inconspicuously next to a gas station. You won’t find white table cloths or fancy wait staff…but you will have the best darn Cuban cuisine imaginable! Seriously…I would drive to Ellijay JUST for a sandwich here. Sure, you could get hamburger or some other lunch staple…but the Cuban sandwich or the Cuban plate are DIVINE. I’m not kidding…they are AMAZING! And the black beans…and fried plantains…and his special green sauce. Gah! I’m salivating as I write! You’ll want to order seconds at Country Corner Kitchen, but don’t…save room for a wine tasting at Engelheim Vineyards. The wine tasting includes 5 wines for $10, and you can pick from any of their selections. Don’t miss the opportunity to take a tour of the vineyard and winery from the owner, Gary Engel. It usually starts about 3pm on Saturday but call ahead to double check. Grab some coffee at The Martyn House In Town. We have another fun day ahead of us, so eat up. You can enjoy GREAT tubing and kayaking via Cartecay River Experience. They open at 10am. You can catch a shuttle to the put-in spot and enjoy a trip down river. The entire experience is about 3 hours, depending on the river height. It’s important to note that a low river will mean your dragging your equipment a bit…and a high river after heavy rains can cause some white water (not too much, but enough worth noting.) There are far fewer people here than Helen, which can make it a little more relaxing if you ask me! Before you head home, make a stop at Expedition: Bigfoot, where you can tour the country’s largest permanent display of genuine Bigfoot artifacts. You’ll see sketches and exhibits, listen to recordings of sightings, see a movie in the Sasquatch Theatre, and more. Want the perfect present to take home to the kids? Pick up the plaster of paris “bigfoot” maker in the gift shop…the kids can make their own Bigfoot footprints in sand, and you can capture a cast of it. I wish I knew more about mountain biking…I think I would love it. If you love it, then be sure to check out Mulberry Gap Mountain Bike Getaway. My goal is to get there one day, rent a bike, take a guided tour…and stay the night in one of their cabins..unplugged! I’ll need to remember the Advil, though! Of course, most people know Ellijay primarily because of their apple festival and plethora of u-pick apple farms. The apple festival is always a great excuse to go – but bring the kids. They’ll love the adventure! Disclosure: Thank you to Gilmer County and their members for hosting us. Opinions here are always our own. 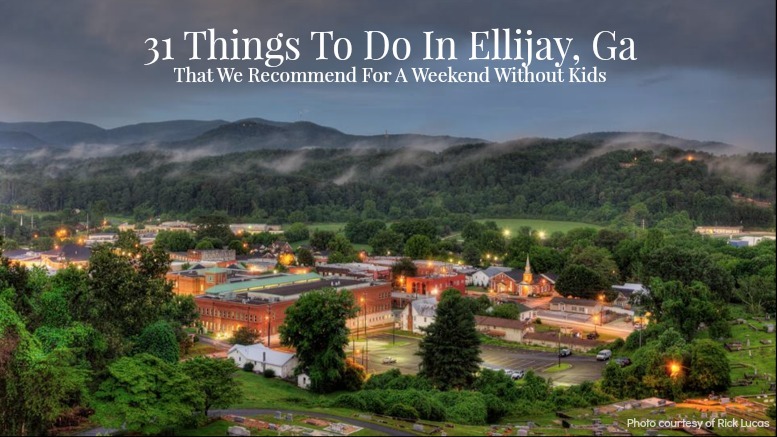 1 Comment on "31 Things To Do In Ellijay, Ga That We Recommend For A Weekend Without Kids"
Ellijay is all that and more. Antiques and eclectic clothing makes great shopping. A trip over the mountian to Dahlonega is a great way to learn about the history of gold mining. Smith House is fun and tasty. It is built over a gold mine.